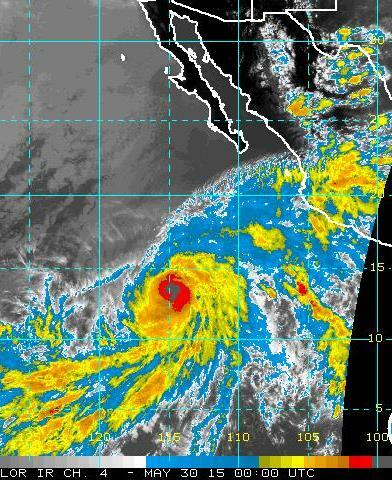 While Andres was heading west towards its eventual demise, a surprise deepening has occurred and the hurricane is now a Category 3 storm. 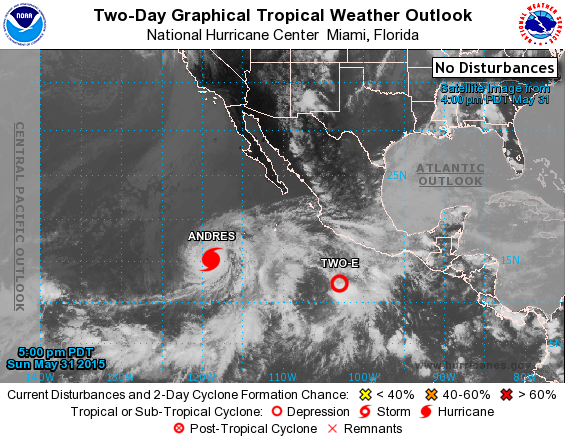 The three graphics here show (above) a visible image of the storm at 3:00 pm MST; below the current eastern Pacific situation with Andres and newly declared TD Two-E; and bottom, IR image of Andres at 5:00 pm MST. 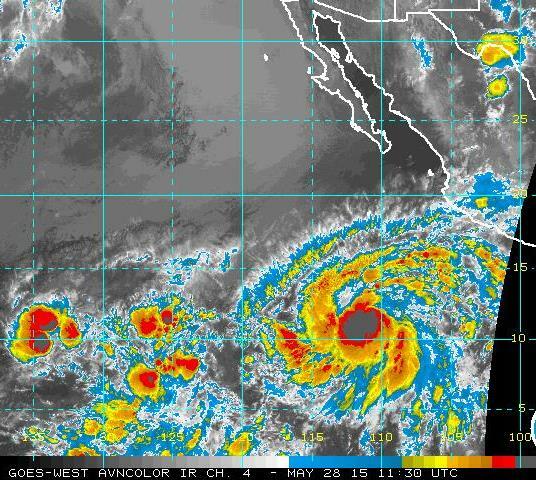 The NHC forecasts Two-E to intensify and become hurricane Blanca. Meanwhile, here in Arizona, the increase in moisture did occur (see earlier post below) and showers and thunderstorms have developed, as forecast by the WRF-NAM almost two days ago, over southeastern Arizona. The plot of CG flash density above (from weather.graphics) is for 6-hours ending at 5:30 pm MST and shows where thunderstorms have occurred. Yesterday (May 30th) was the first 100 degree day at the NWS observing site at the airport - the high reached 102 F. May has been very mild and it has only been during the past few days that the air conditioner has been coming on during the afternoons - nice. Although Andres has provided a nice example of how very far off the long-range, global model forecasts can be, I'm going to venture into those waters again. There are interesting differences between the ECMWF and the GFS operational members at 168-hours from 00 UTC last evening. The 500 mb forecasts valid at 00 UTC on June 7th are shown above for ECMWF and below for the GFS. The two forecasts are fairly similar for the continental U.S., but the differences over the Southwest are enough to be significant. The closed low at 500 mb in the GFS forecast is south and west of the same feature in the ECMWF forecast. The anticyclone to the south and east of the lows are similarly located in different spots (GFS centered over the Big Bend and ECMWF centered over eastern Texas), with the GFS high being much more pronounced. The net result is that the ECMWF has dry, southwesterly flow over Arizona, while the GFS forecasts southerly winds over the state with a long fetch from low latitudes. The GFS forecast allows high PW values of an inch or more (see bottom graphic) to intrude into Arizona and southern California. So, the question will be whether the GFS forecasts are again over-forecasting a tropical moisture push to the north. A back-door front from the Plains is just pushing into the southeast corner of Arizona. The above surface analysis for 12 UTC this morning is from the Weather Prediction Center of the NWS. At 12 UTC the front was actually further west over southern New Mexico than has been analyzed. Moisture at low-levels increases behind the front and the 06 UTC run of the WRF-NAM at Atmo just eases the air from the east across eastern Pima County tomorrow. The graphic above shows the forecast of PW valid at 11 am MST tomorrow morning (May 31st). The PW is forecast to increase to nearly an inch from this morning's value of just over half an inch. The skew-T forecast by the model for TWC at 10 am tomorrow morning (below) shows the cooler and more moist air from the surface to 850 mb, with today's old boundary layer above to about 600 mb. The front does not survive long, as westerly winds tomorrow afternoon push what's left of the Plains air mass back toward the east. The model does forecast some very light sprinkles tomorrow afternoon over in higher elevation parts of Cochise County. As for today, the big question is whether the high this afternoon will hit or break 100 F - yesterday's heat peaked at 99 F at the airport. 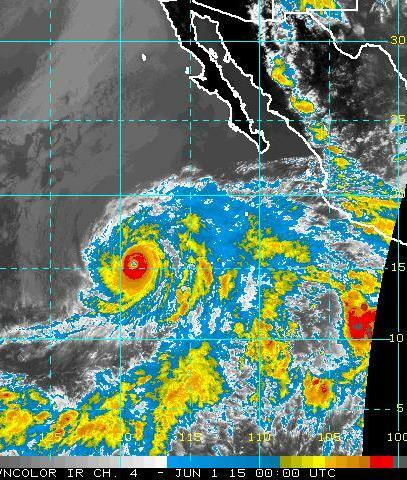 Andres has intensified and become a Category 1 hurricane - the first of the season in the eastern Pacific. Satellite images here are both for 00 UTC May 30th with visible top and IR bottom. Jack Diebolt sent along some maps from the drought monitor page, which inspired me to chase down the map for about a year ago (above). Below is the current status map that shows much change during the past year. Most remarkable is that the extreme to exceptional drought conditions over the Southern Plains and Texas have vanished and been replaced by a great, inland sea. Drought in the West has worsened and nasty water wars are occurring in California and Nevada. Dry conditions have also set in over much of the East, Northeast, and Great lakes. Finally, the map at the bottom shows the change in drought status during only the past two months, as the heavy rain regime setup in the Plains. The rainy period probably reflects a shift northward of the impacts of the current El Nino, which had mostly been confined to Mexico during the winter. Edited to add: In their second advisories issued at 8:00 am MST this morning, the NHC has quickly upgraded the TD to tropical storm status with the name Andres. The tropical development that global models have been predicting the past few days has occurred. 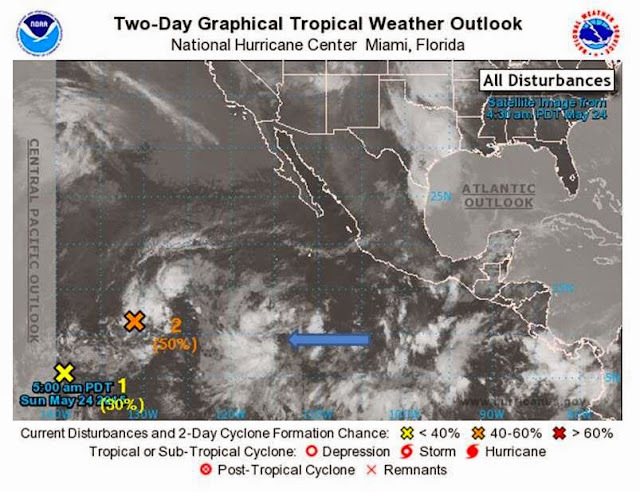 Early this morning the NHC declared that the disturbance near 110 degrees W had become the first tropical depression of the season in the eastern Pacific. The 1130 UTC IR image above shows a very impressive system and perhaps this system got a bit ahead of NHC. Regardless, the models have gradually shifted their forecast for this system westward and the official NHC forecast (below) keeps the system far southwest of Baja. 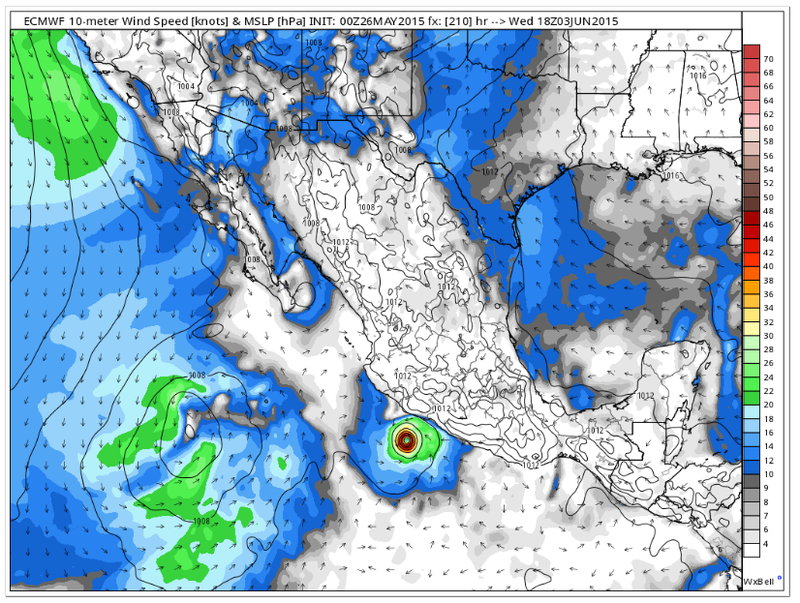 The system is forecast to reach hurricane strength and when named will be TS/Hurricane Andres. Another moisture-starved short wave is approaching the Southwest this morning - as has been the trend for several months. The 12 UTC analysis for 500 mb (above from NCAR RAL) shows this feature approaching northern Baja within the distinct, southern branch of the flow. Water vapor image below (for 1430 UTC) shows considerable upper-level moisture with and ahead of the short wave. 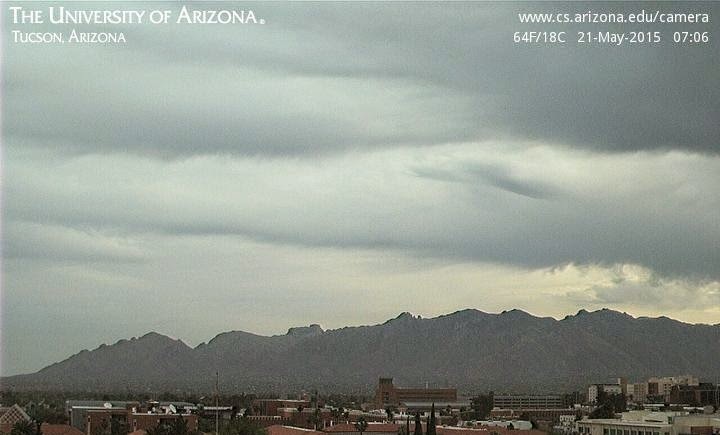 The view of the Catalinas (below at 0753 am MST) shows the thick clouds, bringing us a partly to mostly cloudy morning. The NWS ASOS system at the airport tells us that skies are currently clear - but this inaccurate observation is because the system detects only clouds below 12,000 ft above the surface. Because of automated systems, the most accurate sky cover observations these days are those from major airports, where human observers add additional detail to the automated data. So, while Tucson is "clear", Phoenix has broken cloud cover at 24,000 ft AGL. So it goes. the system moves slowly west-northwestward to northwestward. However, the latest ECMWF operational forecast has evolved strangely and forecasts a small TS into Mexico well south of Cabo Corrientes, with a broad and weak low off to the west of the TS. Forecast below (from Jack Diebolt) is for 210-hours and is valid on June 3rd. As for the GFS, the spread of the ensemble solutions is very great - so there may or may not be a tropical disturbance near Baja in 6-10 days. I am posting these two additional summer outlooks (JJA) just to illustrate how much variability there is among outlooks from different groups/organizations. The above outlook (from Weatherbell, sent along by Jack Diebolt) uses their own analog procedure (different than that developed by Art Douglas). The analog years are fairly numerous, with some years used twice - this outlook indicates above normal precipitation for a very large portion of the country. The outlook below, from NWS CPC, is a subjective outlook that draws upon numerous inputs - their result indicates the country nearly equally split between wetter than normal and equal chances for any outcome (a not very useful category, but probably appropriate for a product with poor verification). Note that there is very significant difference between these two outlooks for Florida and much of the Rocky Mountain states. Meanwhile, the amazingly heavy rains continue over the Southern Plains as we begin the last week of May. Some thunderstorms developed this afternoon ahead of a weak short wave moving across southern Arizona. Composite radar above is from 5:10 pm MST. Graphic below shows 6-hour CG flash density for 6-hours ending at 6:50 pm. At bottom is the 00 UTC sounding plot for Tucson (TWC), showing that some high-based CAPE developed during the day. The storms have mostly occurred to the east and south of Tucson, but a few flashes did occur in eastern Pima County. More serious storm activity was occurring in eastern Colorado this afternoon. Eastern pacific continues active today. Disturbance #2 highlighted by NHC has been spinning away fairly vigorously, as per satellite loops. I have added an arrow to this morning's NHC outlook (above) that points to a new disturbance, not yet highlighted by NHC, which also is showing rotation in satellite loops. Meanwhile, the global models are forecasting a significant event to impact Baja and the GoC beyond 7 days out. Jack Diebolt sent along these GFS graphics from the 06 UTC run last night - they are valid 240-hours out, but are so extreme that I thought I'd show them. 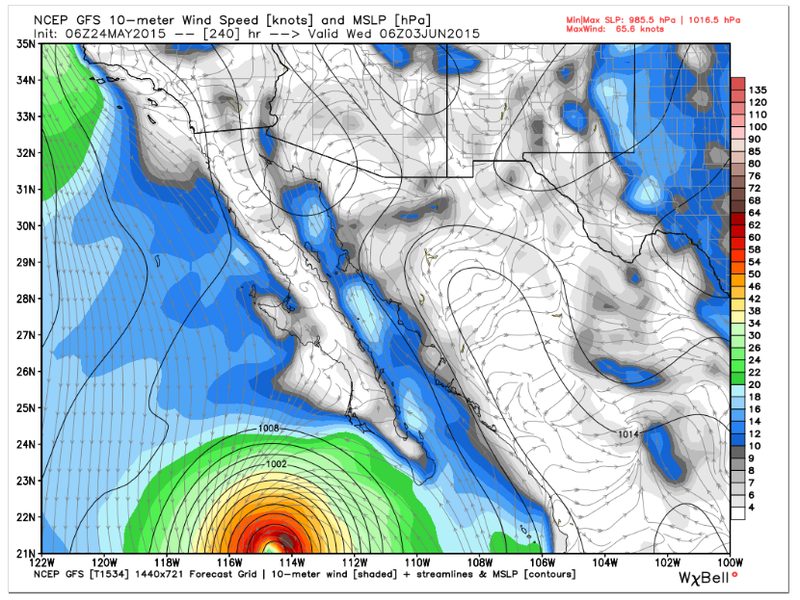 The model currently forecasts a hurricane to be west-southwest of Baja (above) in ten days, with strong winds blowing up the GoC. 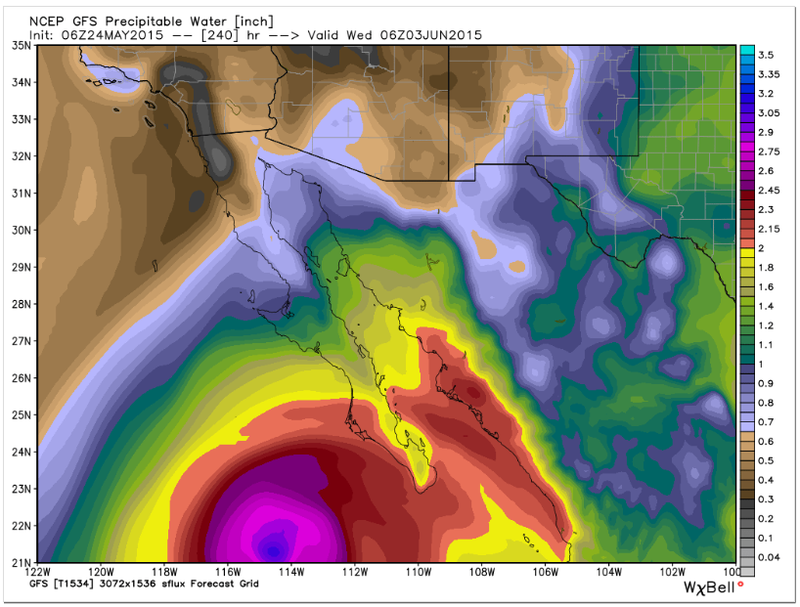 Precipitable water (just below) is very impressive and is forecast to intrude into Arizona by valid time. The bottom graphic shows the model's PW anomalies (as standard deviations from normal). The PW forecast for central GoC is ~ 5 standard deviations above normal for this time of year. Quite some forecast - but of course it is far out on the predictability horizon. 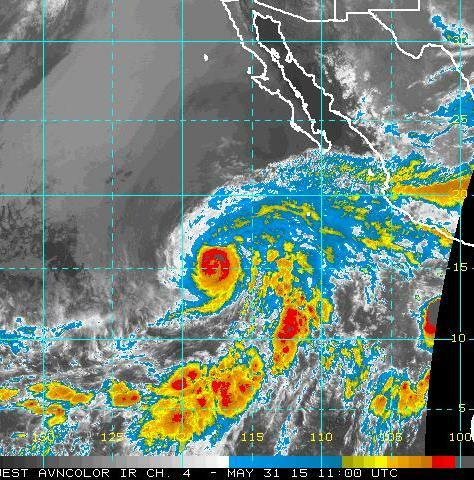 The eastern Pacific is very active, convectively, from 5 to 15 degrees north - above IR image is for 13 UTC this morning, May 23rd. 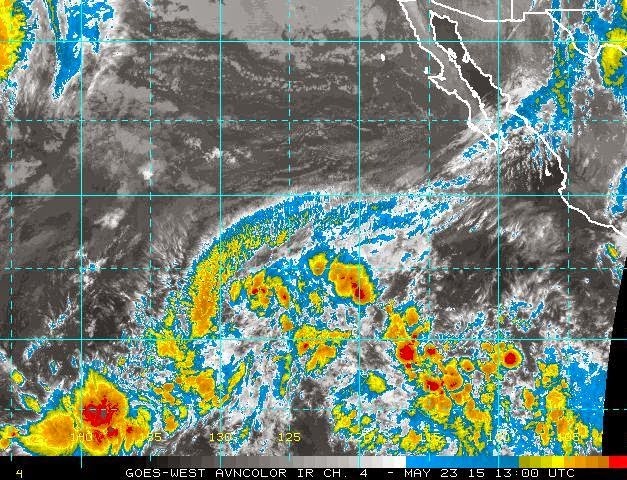 The eastern Pacific tropical storm season "officially" began on May 15th. The current outlook from NHC (below) indicates moderate chances for each of two disturbances to develop into tropical storms - out by day 5 chances increase to 80% for the more northern disturbance, At very long ranges (216 hours valid 00 UTC 1 June), the operational ECMWF (at bottom) forecasts a tropical storm or hurricane to be south of Baja moving north. 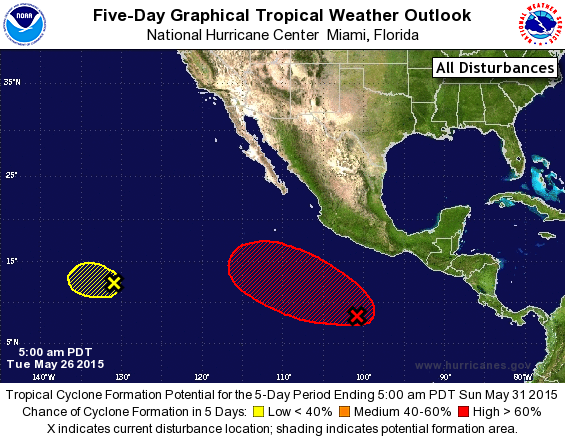 So, this may be the start of an interesting season over the eastern Pacific. I should note that the global models often cry wolf regarding tropical developments at ranges beyond 5 days or so. Art Douglas shared his analog outlook for the next few months, and the precipitation portions are shown below for July and August, with June and September at the bottom. Art does his outlook using a process through which he chooses five analog years. The strong El Nino that is underway, and its temporal evolution, will play a significant role in determining how the next few months will go. Art's analog years are: 1957, 1972, 1982, 1990, and 1991. The El Nino influence can be fickle here in southern Arizona - 1990 was a stormy and wet summer but 1991 was very dry. The persistent trough along the west coast has been related to the El Nino, and it has been associated with May snows in the Rockies and Sierras, as well as unusual wetness in far southern California. 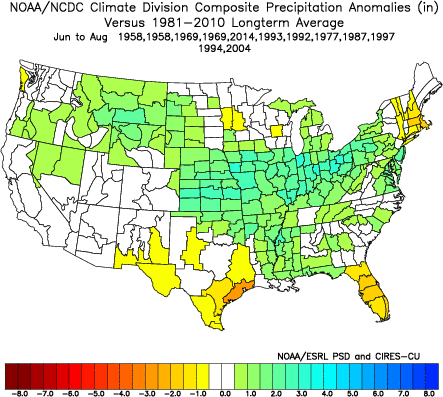 The analog years end up indicating wet conditions mostly to our east and north for July and August (above). 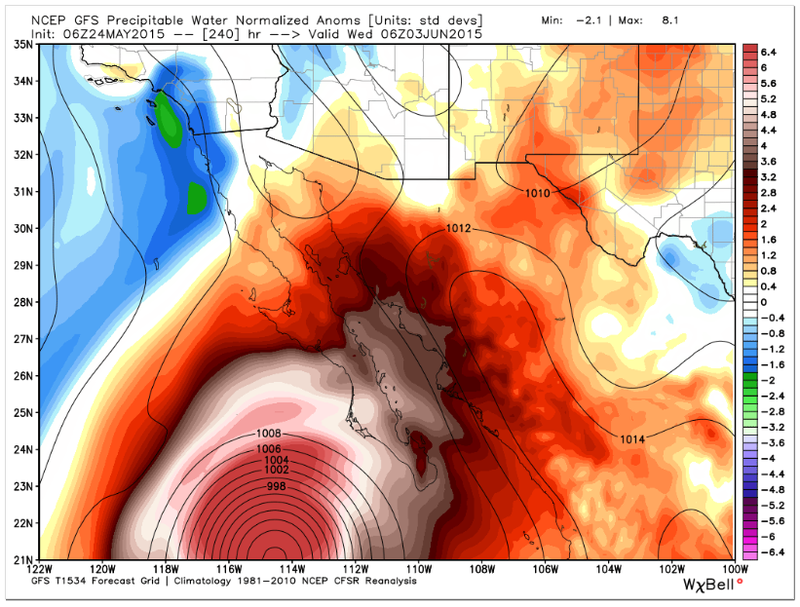 June (first below) years indicate wet over Arizona and southern California - this has been the pattern that has prevailed the last several weeks of May also. 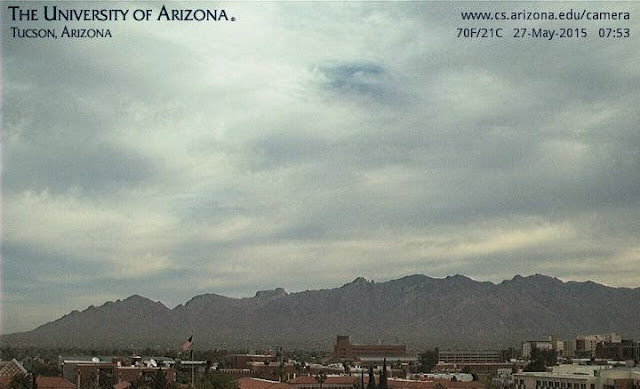 September analog years indicate a return to near normal conditions for Arizona. 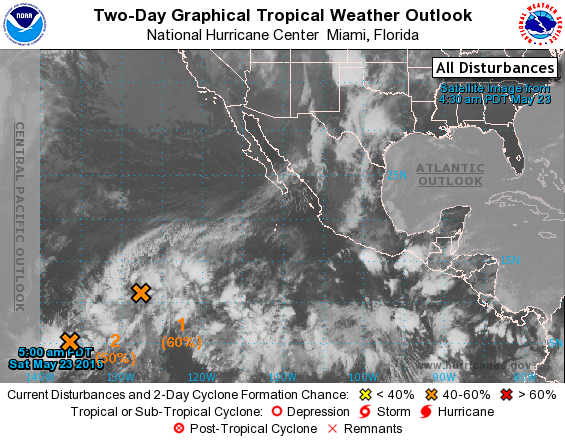 Also of interest will be the character of the eastern Pacific tropical storm season, with perhaps another very active year adding another wild card into the mix. A dreary morning at sunrise today - all images here are a bit before or after 7:00 am MST. View above is of heavy clouds over the Catalinas, and image below shows the widespread cloudiness over southern Arizona. On my walk this morning I could see middle-level buildups, mammatus, virga, and perhaps several very light showers to the south-southwest. The TUS composite radar image at bottom indicates a few echoes across eastern Pima County. There is a wildfire burning north of Sonoita in the grasslands - with about 2,000 acres affected so far. Hopefully this fire will be contained before winds kick up later today and tomorrow. The heavy clouds will limit the vertical mixing to some degree, at least this morning. Later today I'll post Art Douglas' summer outlooks. Driving back to Tucson from northern California, we spent Monday night in Twentynine Palms. Yesterday morning we spent three hours driving through Joshua Tree National Park. This is a huge park that straddles parts of the Mojave and Colorado Deserts. We entered the park at the Oasis Visitor Center (above), which is at the east edge of Twentynine Palms. The highway map just below shows the general location of the park, which is north of I-10 and east of Palm Springs. the second map below is from the NPS and shows the roads, camp sites, and etc. within the park. The most interesting geology, and also concentration of Joshua Trees, is in the northwest portion, while the southern, lower elevation portions are characterized by sandy washes, rugged outcroppings and ridges, and much creosote bush. It's quite a long drive from the I-10 entrance up to the most interesting parts of the park. Here are several photos I shot in the northwest part of the park yesterday morning. The Joshua Trees in this part of the park are quite dense and very large, with spectacular backgrounds. It was interesting that the highest portions of the San Bernardino Mountains, visible to the distant northwest from the Park, were still carrying snow cover from recent storms. Joshua Tree is just one of our National Park treasures that seem to be under attack by some of the country's ill-advised and short-sighted politicians. The visitor books at the Oasis Center were interesting for the number of comments from foreign tourists - one family from Germany noted that this was their second visit in recent years to this amazing park. We have been away for a week on an expected trip to California and have just gotten back to Tucson a couple of hours ago. Here is a quick post regarding the persistent 500 mb pattern that is probably related to the ongoing El Nino. The troughiness over the Southwest U.S. is forecast by the GFS ensembles to persist through the coming week. I show here the, 12 UTC this morning cycle, GFS ensemble 500 mb mean charts for above - 12h valid about an hour ago; below - 68h valid at 00 UTC 23 May; and bottom - 168h valid at 12 UTC 26 May. Unfortunately, the troughs affecting the Southwest have been very moisture starved, at least for southern Arizona. I did find 0.07" of rain in the gauge a bit ago and that was from the early morning event of last Saturday, May 16th.